You know how it feels…it starts with yawning and then you realize that your eyes are slowly closing. Despite the fact that there are a few hours left in the work day, the prospect of having a little nap is much more appealing than the pile of paperwork on your desk. Welcome to the mid-afternoon slump! 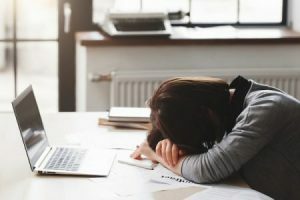 The good news is that there are some practical things you can do to prevent this from happening to you AND no… it doesn’t involve bringing a pillow in from home so you can put your head on the desk for a little siesta. As soon as your eyes get heavy, jump up and walk around. The ‘burst’ of energy gets your blood pumping and your focus off the computer monitor for a little while. Even better, get outside and take some big deep breaths. Sucking in fresh air (as opposed to stale air-conditioned air) will flood the brain with fresh oxygen which helps to ‘wake up’ your grey matter. It may be your lunch that is causing the problem: if you usually eat over-processed, high GI foods for lunch (such as white bread, chips or sugary foods), then your ‘slump’ is most probably caused by a drop in blood sugar levels. The problem with eating high GI foods is that they quickly elevate your blood glucose but this is not a sustained rise: insulin will soon bring the glucose levels back down and then the tiredness results due to your sensitivity to the blood fluctuations. Often, to combat your mid-afternoon slump, you might find yourself looking to eat something sweet (watch out vending machine!). While this might make you feel better, the effect will be short lived – in fact, you are just fuelling the ‘roller coaster’ effect on your blood sugars. Forget sugar! Instead look for a high protein snack combined with a little low GI carbohydrate to keep your blood sugars on a more even keel. Keep some raw almonds / dried apricot mix in your handbag – this is a perfect snack to ‘fight off’ the fatigue! Finally it is important to continue drinking water throughout your day: while your job may be sedentary, air-conditioning can be quite dehydrating. Not drinking enough water during the day can put you not only at risk of feeling fatigued, but can also make you more prone to headaches, loss of concentration and dry eyes. The Natural Way also recommends taking their exclusive formulations – B+ Zinc & Passiflora and Endocrave – during the day to help ‘stop’ the slump. To find out more about how these work to keep you alert all day, please contact your nearest clinic on 1300 SLIMMER (1300 754 663). If you regularly encounter a mid-afternoon slump, and have been eating chocolate to try and avoid it, then this may be one of the reasons why your weight is a problem for you. The Natural Way is not just about weight loss – we offer you a whole ‘lifestyle’ program, so once you lose weight you know how to keep it off. We teach you how to overcome everyday challenges in a healthy way through our comprehensive Healthy Living program. To find out more about The Natural Way please call 1300 SLIMMER (754663) and make a FREE appointment to find out more about how we can help you to get back the body you want.